If you have any questions or suggestions you are welcome to join our forum discussion about Support and Resistance, Part II. Support and resistance levels are used very often by traders for providing a signal of when to enter or exit a trade. 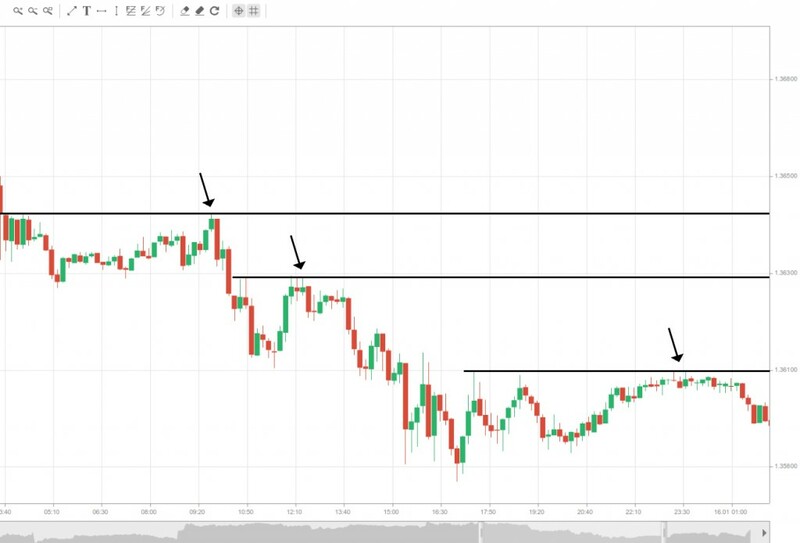 Since they are broadly established key points of price reversals, it is common that prices will rebound back up after hitting a support level, given you have defined them well. Such a scenario is illustrated on the following screenshot. As you can see, the price rebounds from the support level and begins rising, giving us a signal for a long entry. Logically, this tactic works the other way around. As prices rise and eventually reach the “ceiling”, they will most likely bounce off the resistance and correct, given there is no breakout of course. 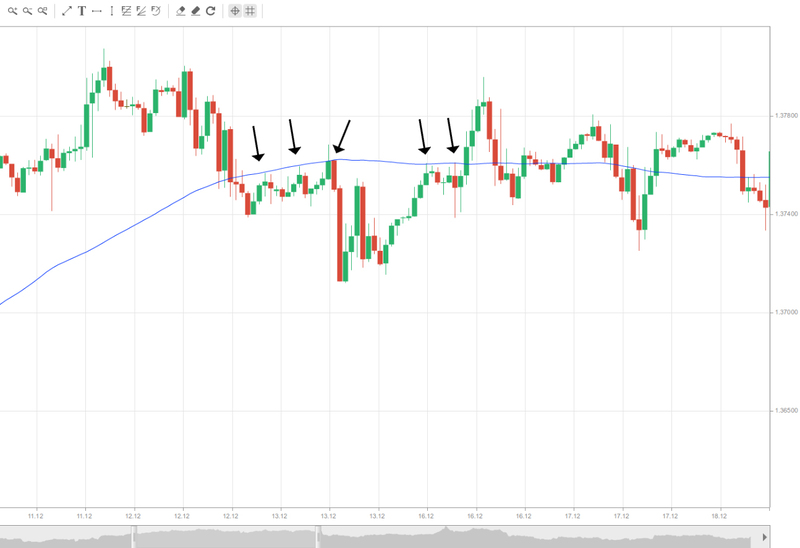 On the screenshot above you can see that the market bounced off the first level of resistance and retreated, followed by a rebound in a second and a third level of resistance, followed by further drops. Apart from significant peaks and troughs, we’ve already mentioned that other levels can act as support and resistance as well, such as whole numbers, upper and lower boundaries of channels etc. But this is not all. Moving averages can also play the role of support and resistance levels. Usually falling prices tend to rebound when hitting a moving average from above, but when they do manage to break through it, a strong sell signal is generated. This works the other way around as well. 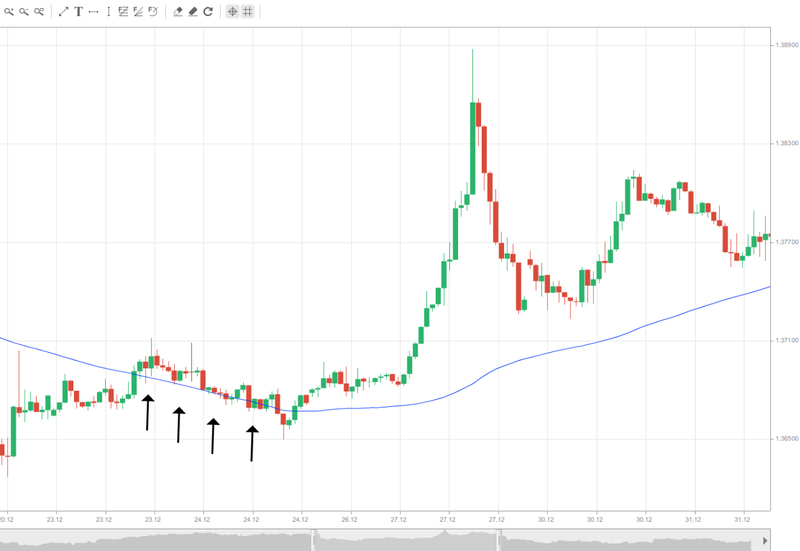 Rising prices tend to encounter resistance when approaching a moving average from below, and usually a buy signal is generated if they manage to penetrate it and continue to advance. Apart from all the listed levels which can act as support and resistance, pivot points are also a factor which plays a role in price movement. They will be thoroughly explained in the chapter’s next article “Pivot points”. As we’ve already mentioned earlier, although supports and resistances are likely to cause a price reversal, in many cases the momentum is so strong that it manages to penetrate these levels, or a so-called breakout occurs. We’ve said that near the support/resistance level, a battle between buyers and sellers is led and once the price swings back or goes beyond the established level, we learn what the outcome is. Once prices break out of the trading range, we know that buyers have come in control, if the asset is gaining, or the sellers have won, if the price is going down. This generates a signal in both cases and allows us to set a profit target before the next support/resistance level. It is often observed that the longer a level holds and the more the failed attempts to break it, the stronger the move will be after the breakout finally occurs. Another general rule of thumb is that the more times prices have tested a level, the weaker it becomes and eventually will be broken. This is because each price reversal is due to traders who bet against the market. As that specific price level (for example resistance) gets revisited more and more times, there will be fewer people (sellers) who would want to bet against the market, thus allowing their counterpart (buyers) to eventually overcome them, and a breakout will occur. Although breakout trading is very popular and known for many years, it continues to be a viable and profitable trading strategy. This is based on the fact that breakouts are powerful signals showing the initiation or continuation of a directional trend. Here is an example of a breakout. Sometimes, however, prices do manage to penetrate through a support and resistance, but a retracement follows shortly after, thus rendering the breakout false. We’ve mentioned earlier in the article that usually a support/resistance is not deemed broken, if there is no candle or bar which closed outside the respective level after penetrating it. In some cases, prices fall back below the broken resistance or pull back above the support even after several candles have closed. Such a scenario is visualized on the following screenshot. 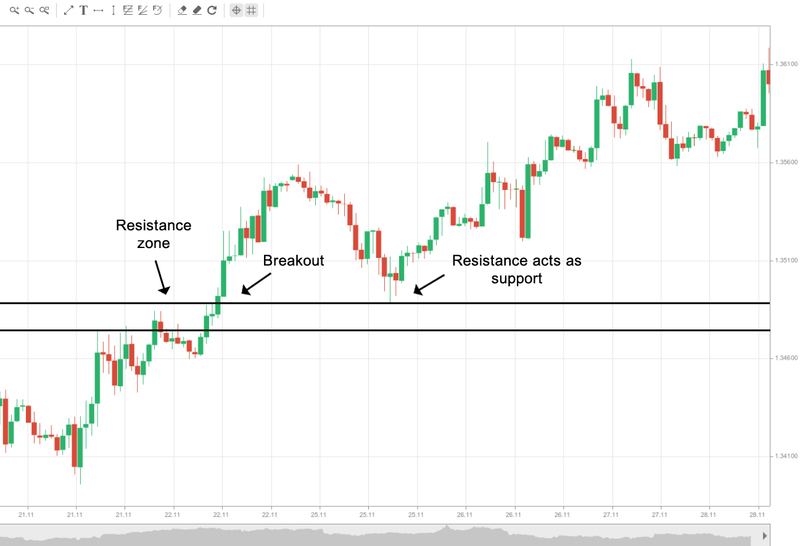 If a trader wants to use the long-entry signal a resistance penetration has generated, but still wishes to protect himself from a false breakout, it is wise to wait until the previously established resistance level switches roles and begins to act as a support. Logically, this works the other way around as well. It is not uncommon for prices to come back to the breakout level before they continue on. This way a resistance can begin acting as a support and vice versa. The following example illustrates that case. You can see that the price had found resistance in the respective zone, but eventually that level was broken. Those people who did not anticipate a breakout and went short right before it, accumulated losses as prices surged and broke the resistance level. 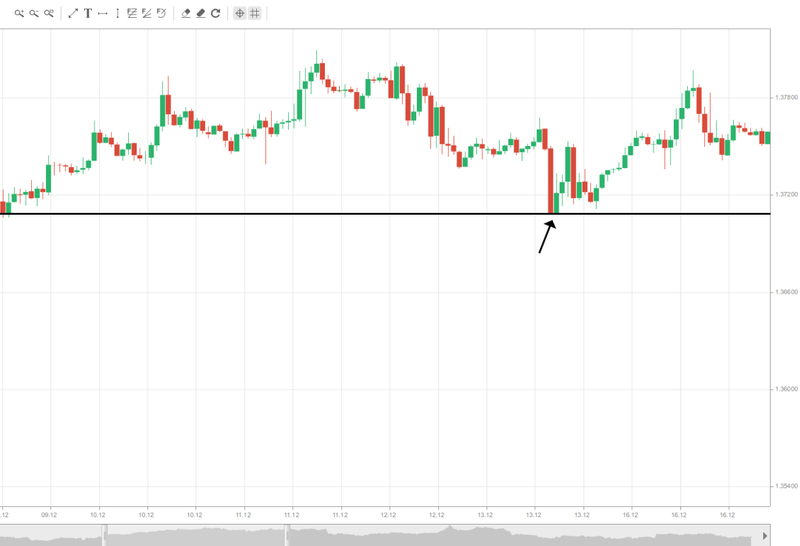 However, as the price fell back to the previously defined resistance level, those people who went short would want to close their positions after their losses were minimized. And since closing a short position actually means buying the asset, they bring buying pressure back to the market, thus pushing prices up. 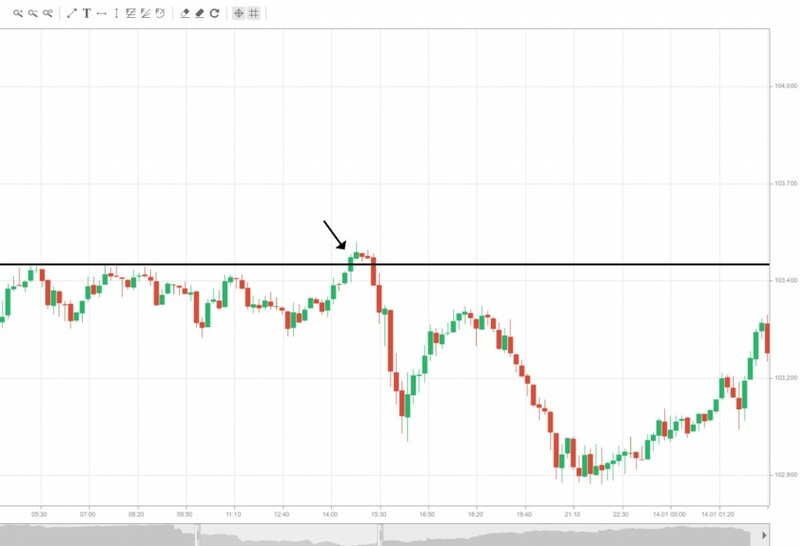 As soon as other market players who haven’t entered the market yet see that the previously established resistance level has begun acting as a support, they place long-entry orders (because what they saw is a rebound from a support – a bullish signal). This additional buying pressure, coupled with short covering, further lifts the price and could set the ground for the initiation of an upward trend. Similarly, a support can become a resistance, once the price has broken below it and both long-exits and short-entries apply downward pressure.